People who handle explosives usually have heavy-duty tasks to perform – dislodging rocks, demolishing old buildings, or triggering an avalanche. But explosives can be used for delicate tasks, too: They make it possible to emboss holograms in steel. Nearly everybody carries them around, on banknotes, EC cards or tickets for a pop concert: holograms. The colorful, iridescent interference images protect banknotes and documents against forgery. They take a great deal of effort to produce, and are almost impossible to copy. This is because the image is created not only by the interaction of different colors and contrasts, but also by the surface structure. Different pictures can be seen, depending on the direction from which the light is shining. Holograms are normally produced with the aid of laser beams, starting by creating a prototype from photosensitive material such as Fotoresist. However, this template is too soft to be able to act as an embossing or injection-moulding tool for holograms. Consequently, the filigree relief pattern is copied onto a harder material such as nickel by means of electroplating. Mounted on a roller, this nickel shim transfers the hologram onto a plastic film of the kind that can be seen on EC cards and concert tickets. Researchers at the Fraunhofer Institute for Chemical Technology ICT in Pfinztal have now adopted a more radical method. The scientists are using explosives to impress holograms in steel. With the right dosage, explosives enable a template to be copied with far greater accuracy than by conventional methods. The ‘explosive embossing’ method achieves a resolution in the two-figure nanometer range. “Nobody believed such a thing could be possible,” raves ICT project manager Günter Helferich. Almost any structure, be it wood, leather, textiles or sand, can be rapidly and accurately impressed on metal in perfect detail with the aid of a sheet explosive. The scientists are now working with industrial partners to create steel tools with holographic structures – as a ‘stamp’ for applying holograms to plastic parts. The challenge is tremendous: The structures that have to be imprinted into the steel are so tiny that they cannot even be discerned under an optical microscope. The experts have optimized the method to the desired image sharpness through numerous series of experiments. how about using this technique to create steel with unusual surface characteristics? 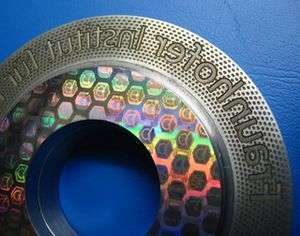 If the normal way to make a hologram-die is to nickel-plate the interference-pattern, and use the interference-pattern in the grown nickel as a die. . .
but have problems with the nickel being too soft. . .
Why not just harden the nickel after it's been grown? Like with some chemical change to it that adds hardness, or by hitting it with ions or something, to knock out the smoothness of its crystal-lattice? Wouldn't that be more cost-effective than replacing the entire nickel-plating technology? It will destroy the templates. It might work also if you dropped safes out of skyscraper windows to impress the template images onto the metal. OK get you slide rules.. if you dropped a safe onto a nuclear fusion fuel pellet what's the probability that you'd get hydrogen fusion from the impact? multicolored tattoos will wear off since the skin's outer layer flakes off.